In the twenty-fifth issue of the Bed and Breakfast Traveller, we take you to Muskoka, located ninety minutes north of Toronto, Ontario, Canada. In the Huntsville/Lake of Bays area of Muskoka, you will find nearby and abundant wilderness, community friendliness and spirit, urban amenities, and many events and attractions. Canoeists, kayakers, hikers and bicyclists can pursue their passions in world-famous Algonquin Provincial Park www.algonquinpark.on.ca or Arrowhead Provincial Park. 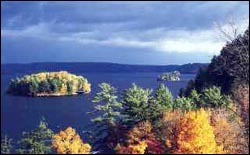 Breathtaking scenery abounds throughout the Muskoka Region. Some of the best views, especially in the fall colour season, are from the Dorset Fire Tower (open from May to October) and the Huntsville Lion's Lookout overlooking Fairy Lake. 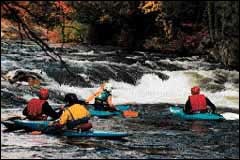 If you love the soothing sounds of flowing water, you'll enjoy the Baysville Dam, Port Sydney Dam, Ragged Falls, or The Locks Park where Fairy and Mary Lakes join via the Muskoka River. · the Barachois Quartet from P.E.I. · the Arrogant Worms with their high energy & audience participation. 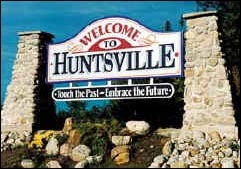 Huntsville Farmers Market in the Canadian Tire parking lot from 9 a.m. - 2 p.m. Animal Art in the Park 2002 at the Algonquin Gallery featuring the art of A.Y. Jackson from the Group of Seven, as well as the works of over 50 acclaimed Canadian and International wildlife artists. www.algonquingallery.com. Algonquin Visitor Centre presents "Mystic Wilderness" - unique Algonquin watercolour and acrylic paintings by Linda Sorensen of Killaloe, ON. Her works featured hand-painted and sculptured frames of rock and antler gathered from the wilds, and "Algonquin Vistas" - an exhibition by William Veale of Perth, ON, depicting in watercolour and acrylic the four seasons in the Park. Advanced Wilderness Photography at the Leslie M. Frost Natural Resources Centre in Dorset with acclaimed wilderness photographer/instructor Rob Stimpson. www.algonquinacademy.org. Loggers Day at the Algonquin Logging Museum. Entertaining and educational. Includes the Wakami Wailers singing shanty songs; demonstrations around the Logging Museum trail. Admission is $1/person. Old time loggers' lunch costs $6/person and is served in the sawlog cookery from 12 p.m. - 2 p.m. (while quantities last). Algonquin Visitor Centre (613)637-2828. "Art in Algonquin Park" at the Algonquin Visitor Centre. An eclectic display of artwork that explores the unique perspectives of Algonquin Park. Dorset Arts & Crafts in the Park. Local artisans and crafters display on the shores of Lake of Bays at the Dorset Parkette. The event is outdoors, rain or shine. Muskoka Music Men present their annual show, 'A Night of Harmony,' www.muskoka.com/music-men. 11th Annual Heritage Boat Show at the Huntsville Town Docks from 10 a.m. - 2 p.m., featuring the finest in local antique and classic wood boats. There will be a parade of boats between 1:45 p.m. - 2 p.m. (weather permitting). Visit the Town Centre merchants and judge for yourself whose scarecrow is your favourite in the Annual Charity Town Centre Merchant Scarecrow Contest. On Saturday, local non-profit organizations line the Main Street for what has been called "the Biggest Bake Sale in Muskoka." Fall Colours Arts & Crafts Sale at the Dorset Recreation Centre. Thanksgiving Arts & Crafts Sale at the Dorset Recreation Centre.